Start with the end of yarn on the left as shown in picture, wrap the yarn over the top of your three fingers and come back up under the bottom. Now do a second wrap like the first. 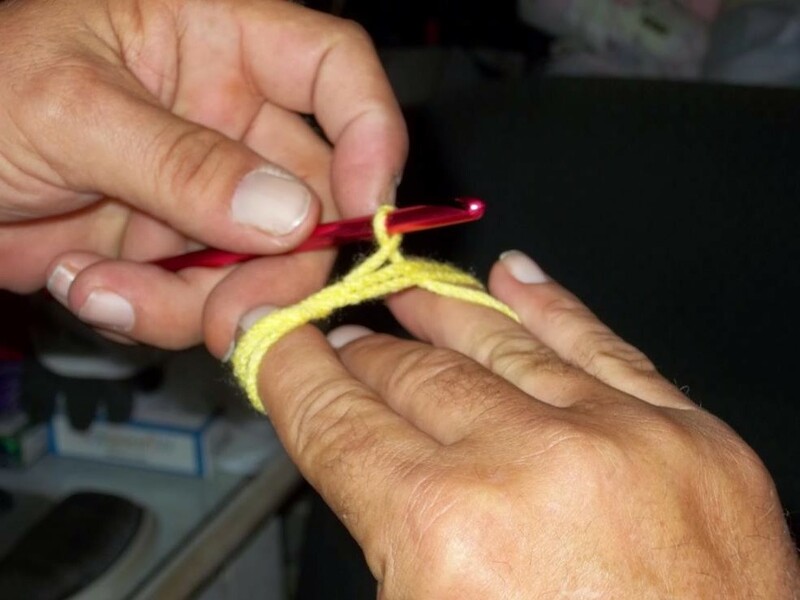 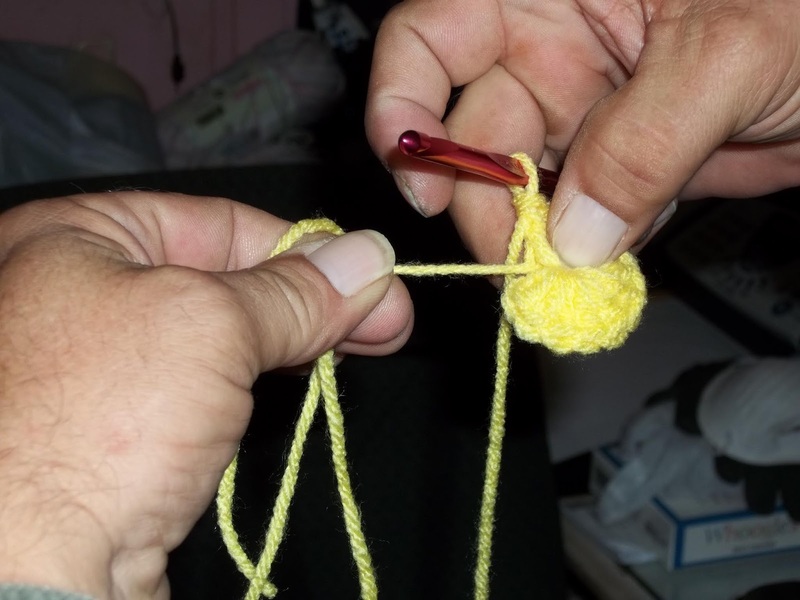 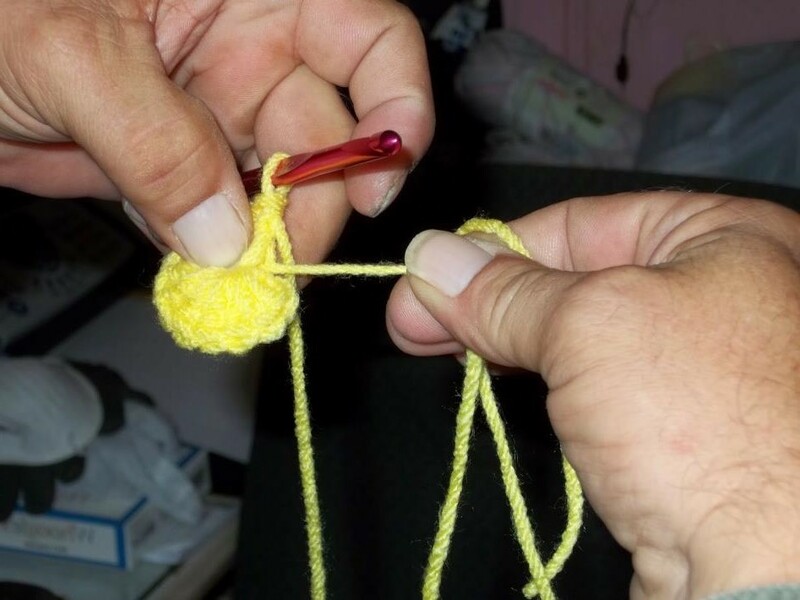 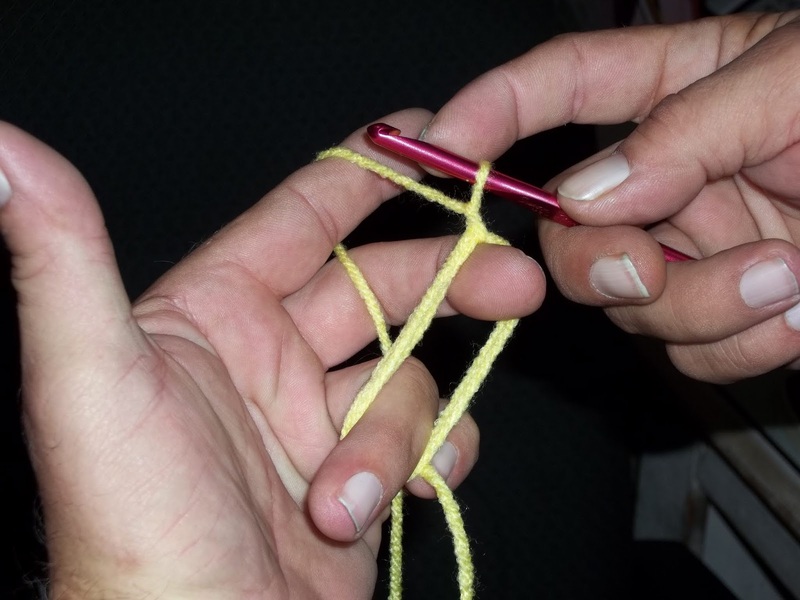 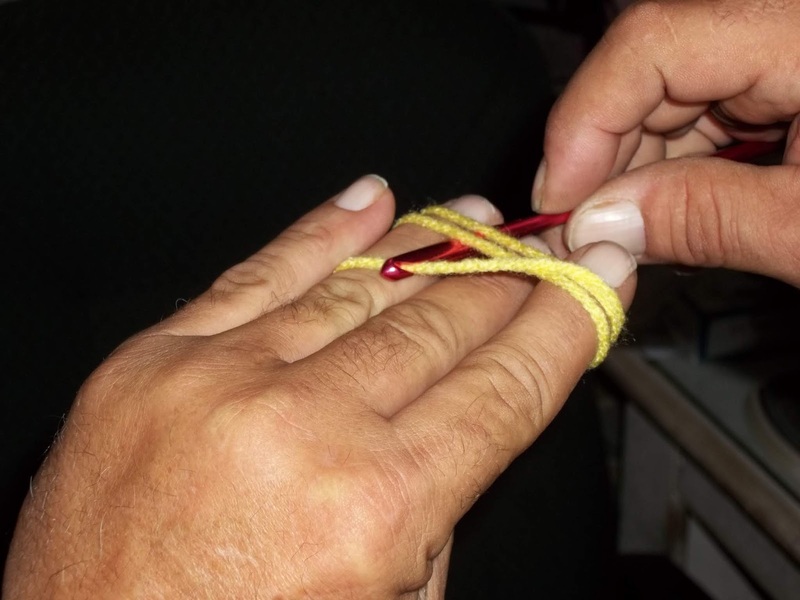 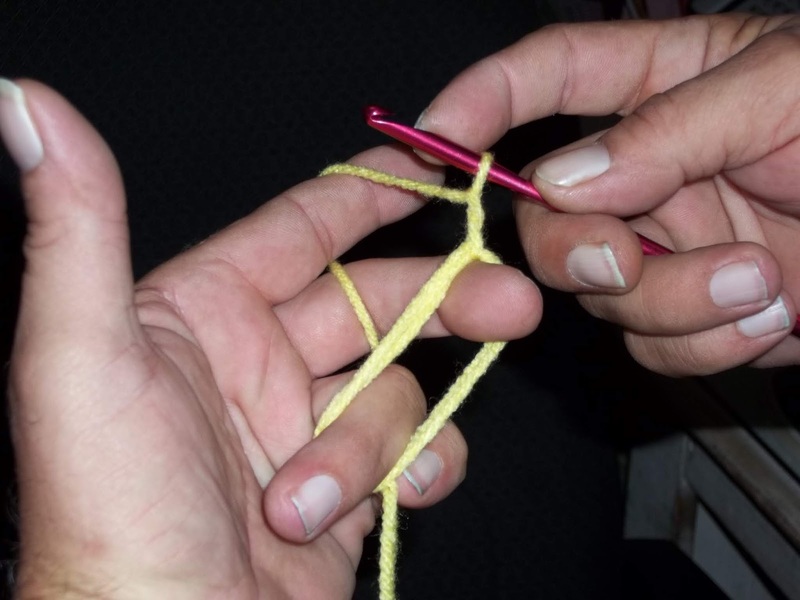 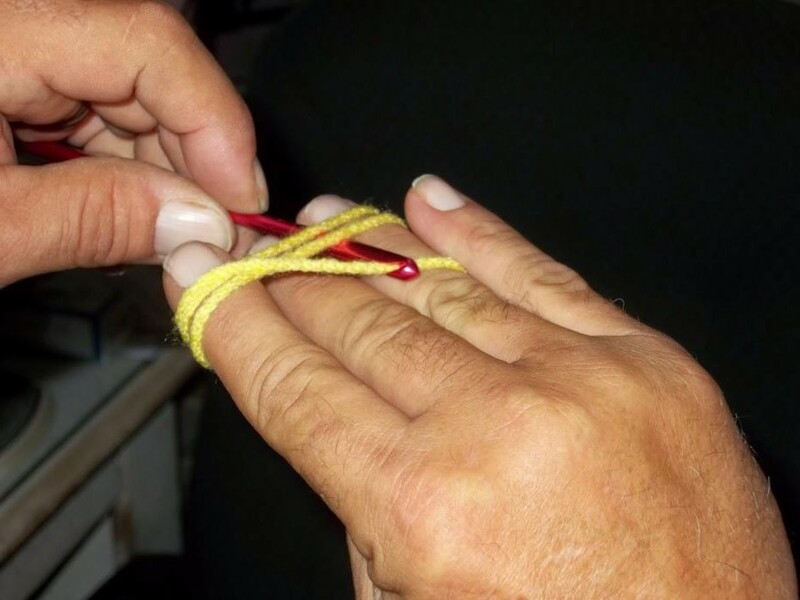 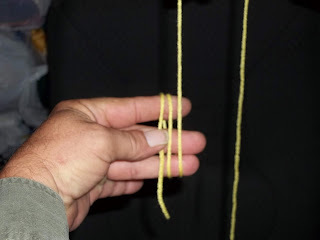 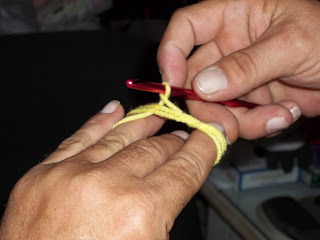 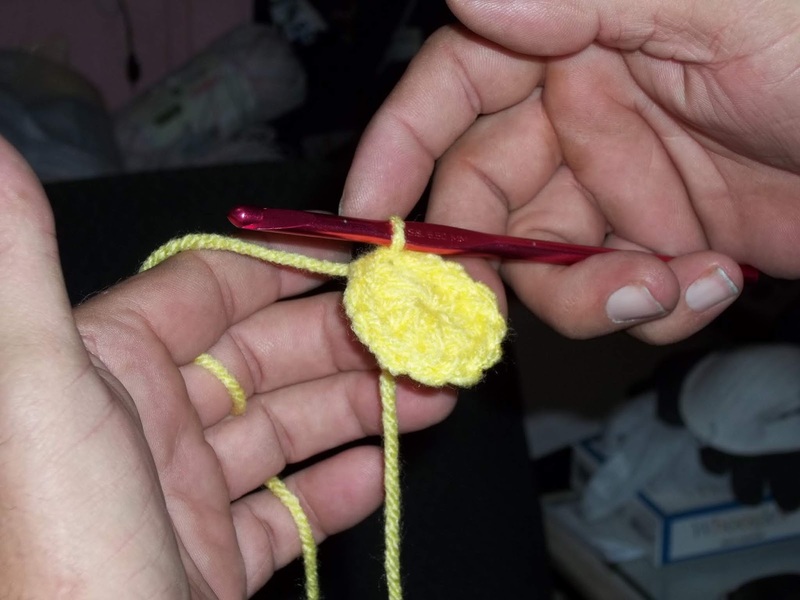 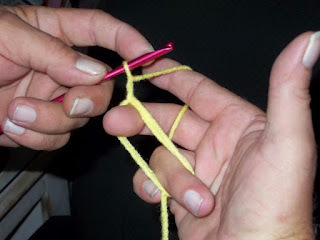 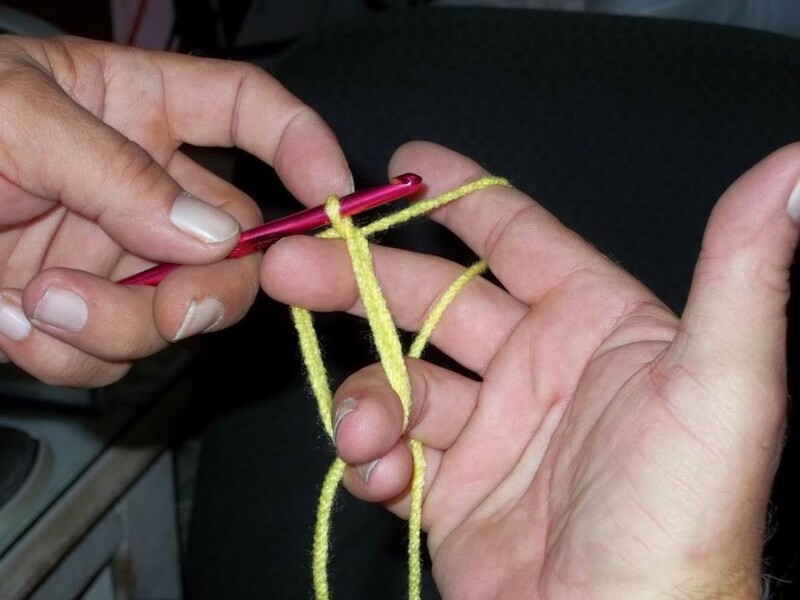 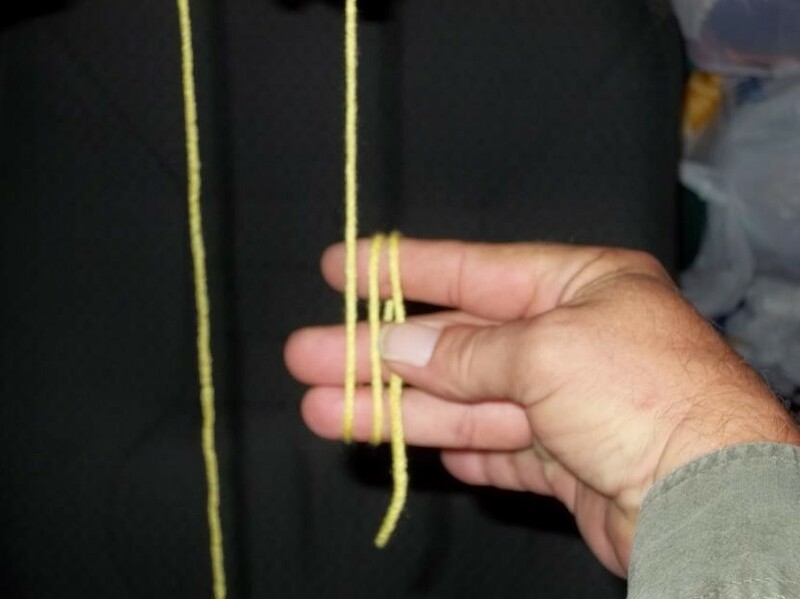 Now you will bring the yarn over to back of hand and put the end towards your knuckles under your little finger. 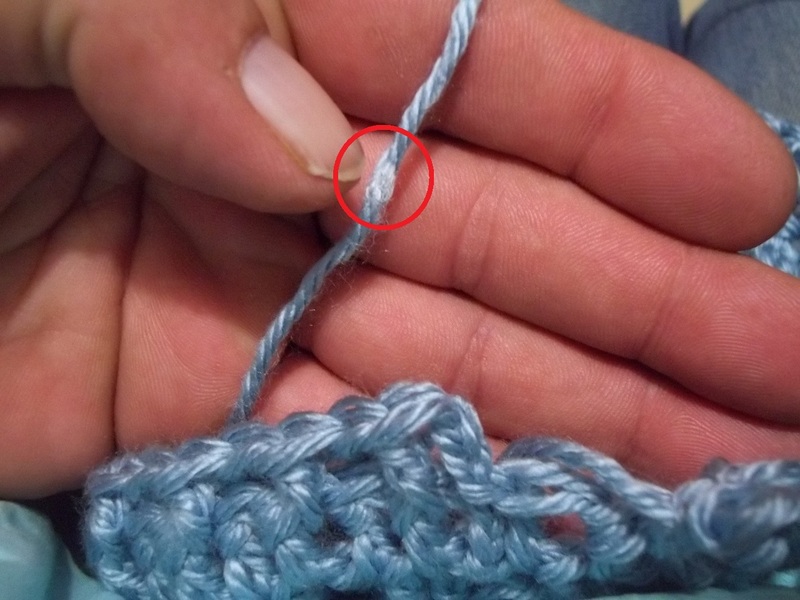 By doing two wraps instead of one, the chance of the circle coming undone after the piece is finished is greatly reduced. 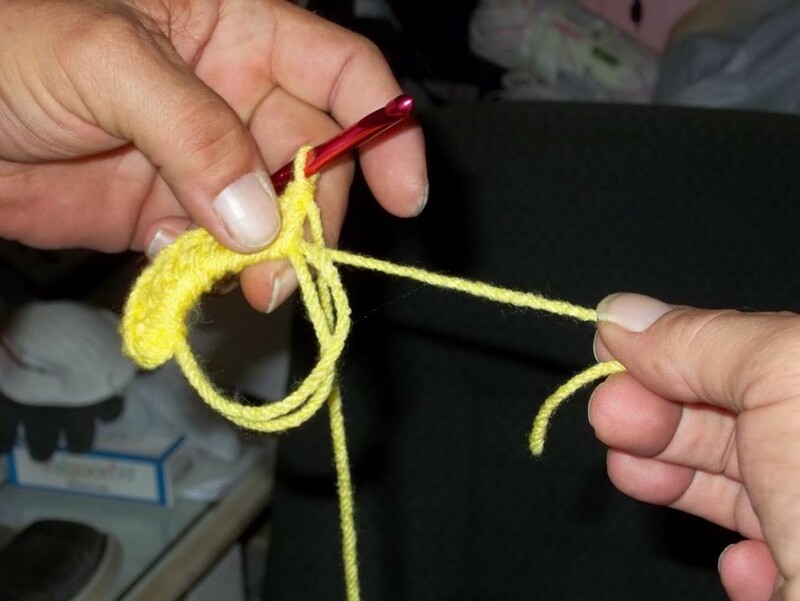 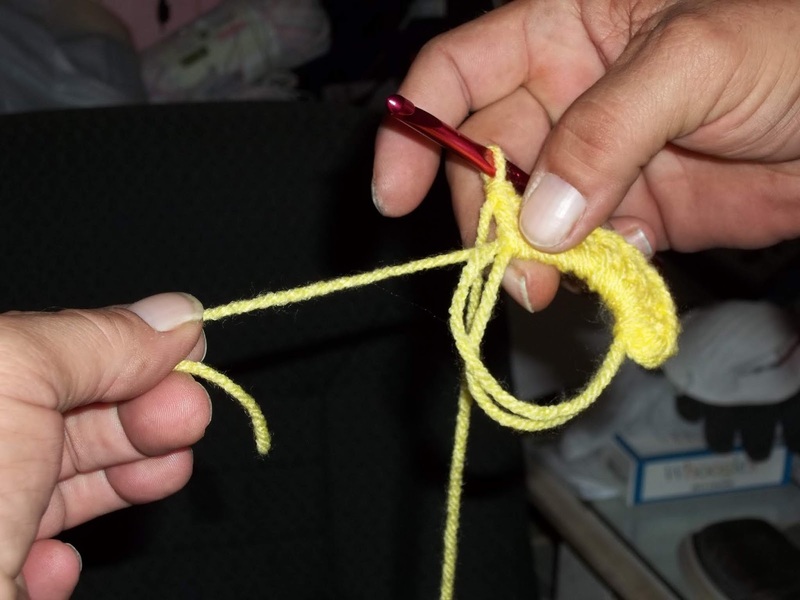 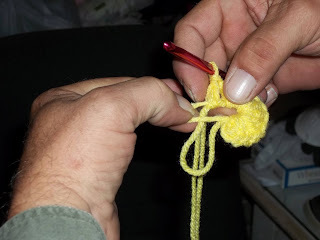 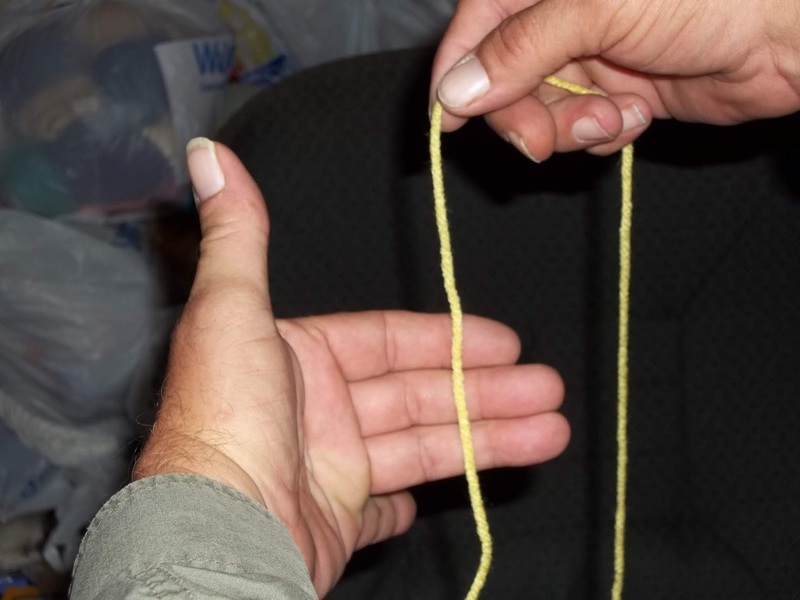 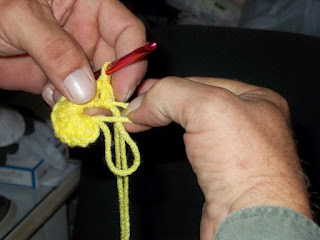 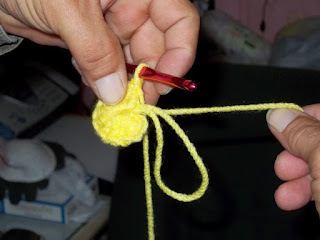 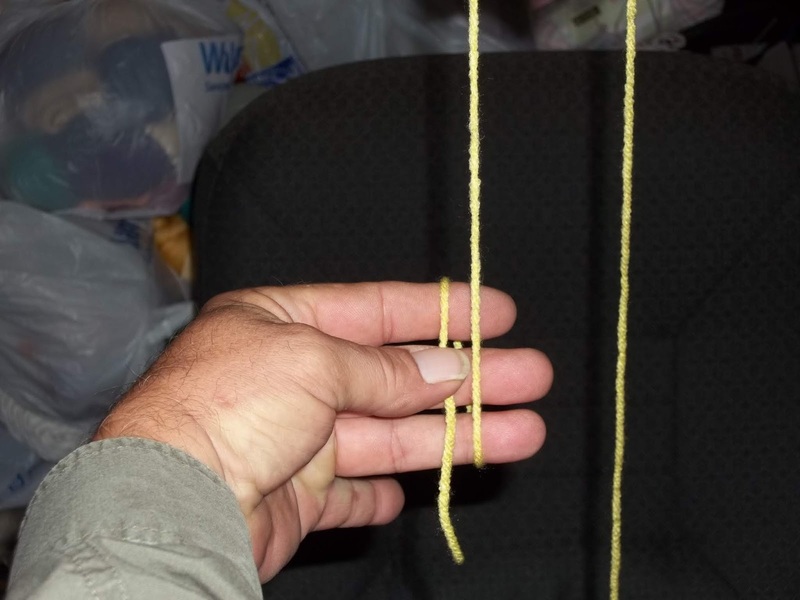 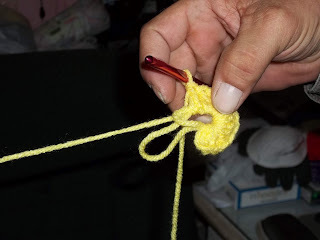 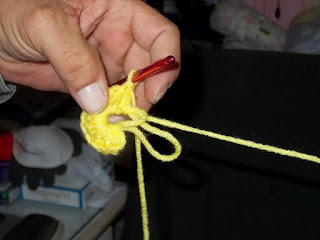 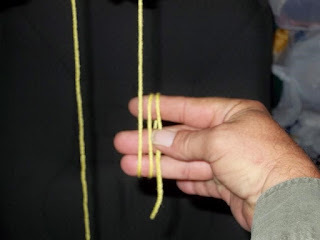 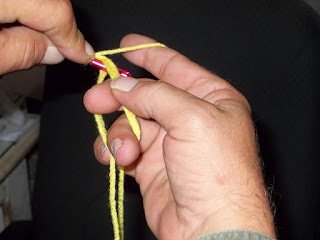 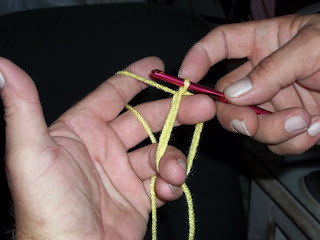 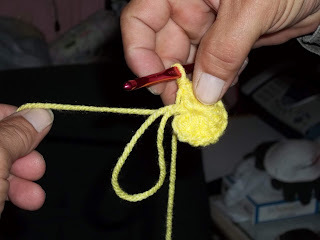 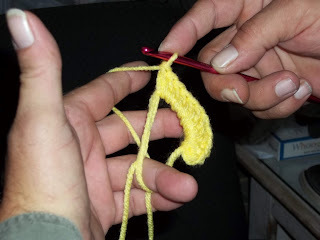 Insert your hook as shown and draw up a loop from the skein end that you previously tucked under your little finger. Now you will shift the loops off of the index finger as shown in this picture. 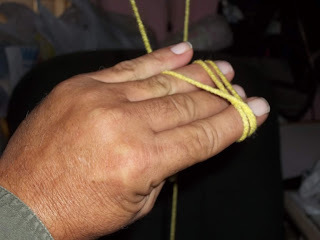 To begin a SC round you will chain one now. To begin a DC round as I am doing, you will chain 2. 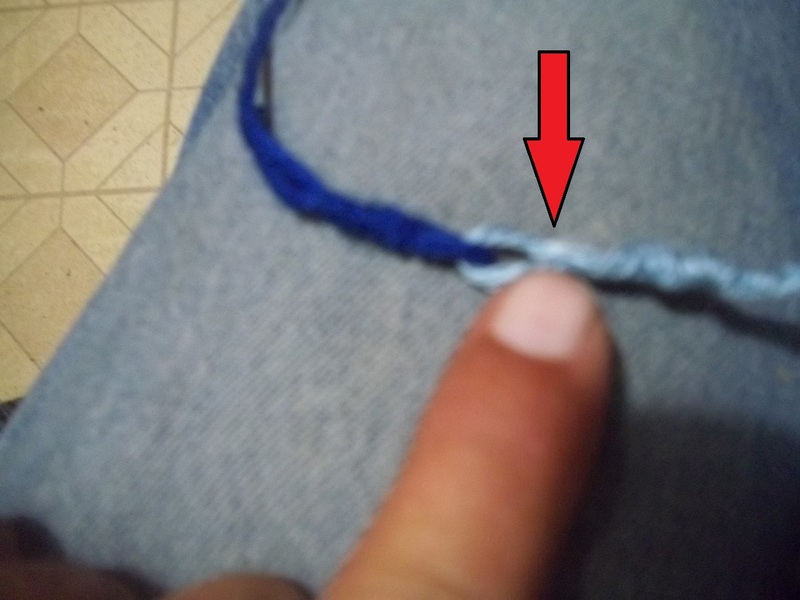 Now proceed to do your DC stitches into the ring until you are ready to close the ring. 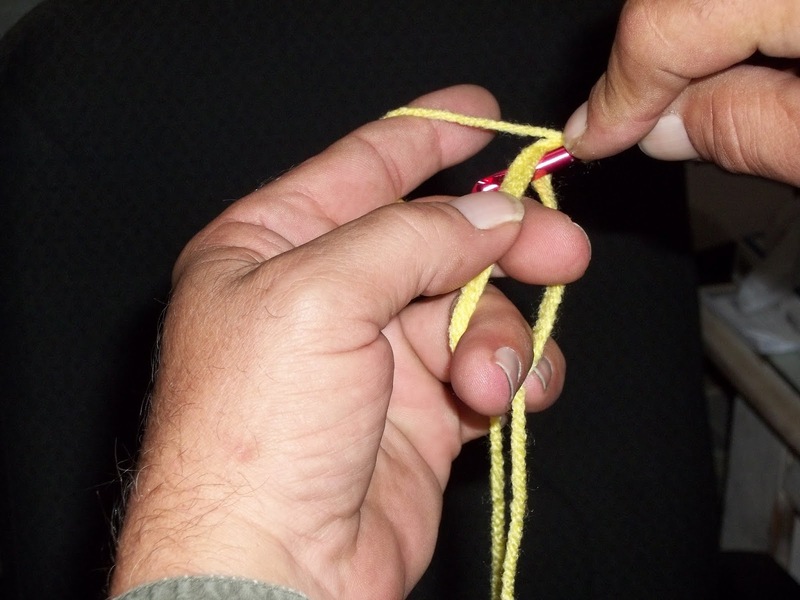 Once you have the correct number of DCs in the ring, pull the tail gently until you see which ring of the two is closing. Do NOT close the ring completely. 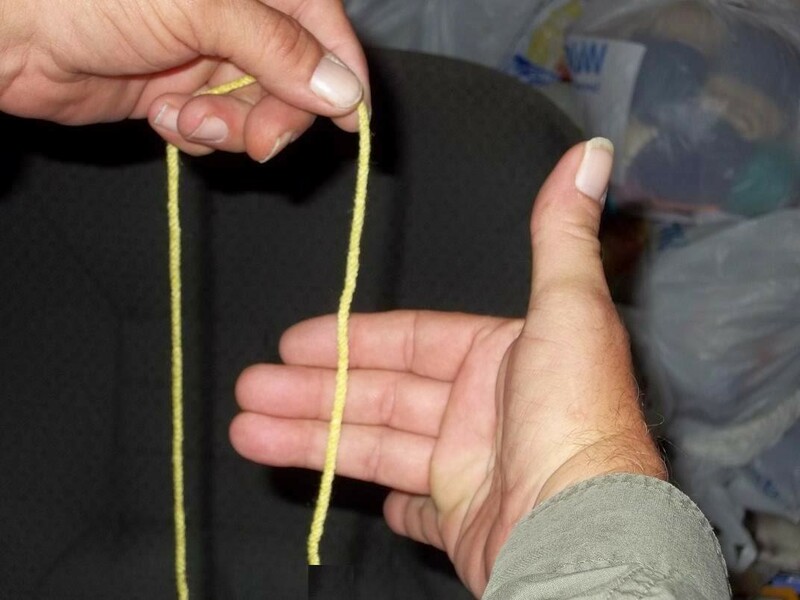 You will see one ring shrinking like pictured here. Grab the littler of the two rings and tighten the other ring by pulling it. Now pull the tail of yarn again and close the ring tightly. As shown in this picture, the Magic Circle with two wraps is now closed. 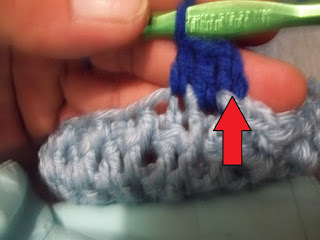 Now slip stitch into your beginning stitch as the instructions or pattern stated. Start with the end of yarn on the right as shown in picture, wrap the yarn over the top of your three fingers and come back up under the bottom. 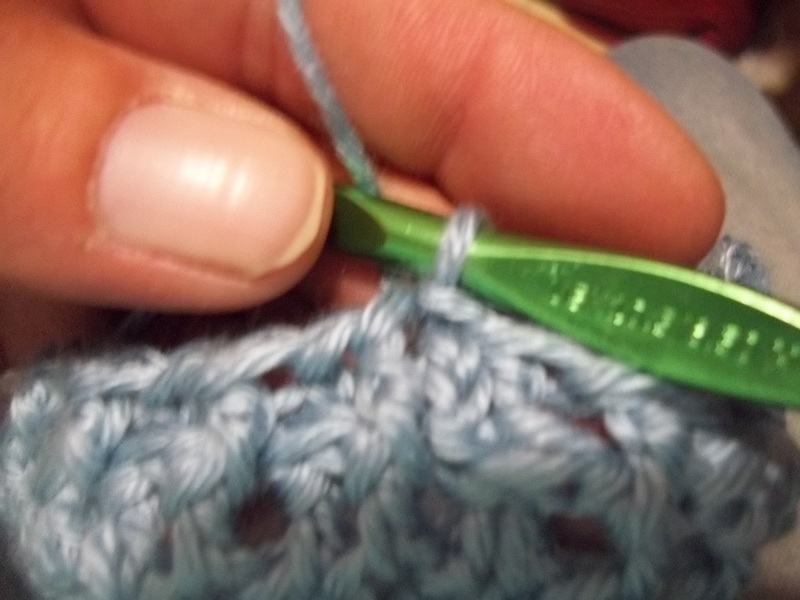 I am now finished with my first color on this hat and am ready to join in my next color, as this picture shows. 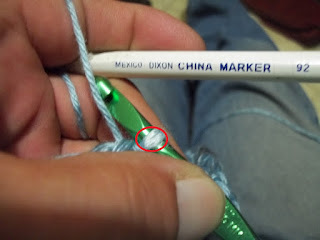 I will now mark the yarn so I will know where my join needs to be so the color change will take place right where the arrow is pointing in this pic. After marking the join spot, I undo two to three stitches. You can see the mark on the yarn better here after I have undone two stitches. 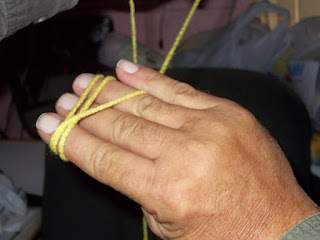 Now I am ready to begin doing the Russian Join. In this picture you will see how I entered the needle almost in the middle of my mark. 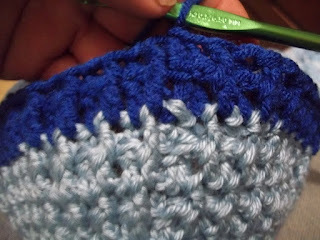 I am now showing the join almost completed in this pic. You can see the mark on the yarn and all I have to do is pull the ends and lock the join and trim the ends. Now after doing a few stitches you can see how the color change join looks. 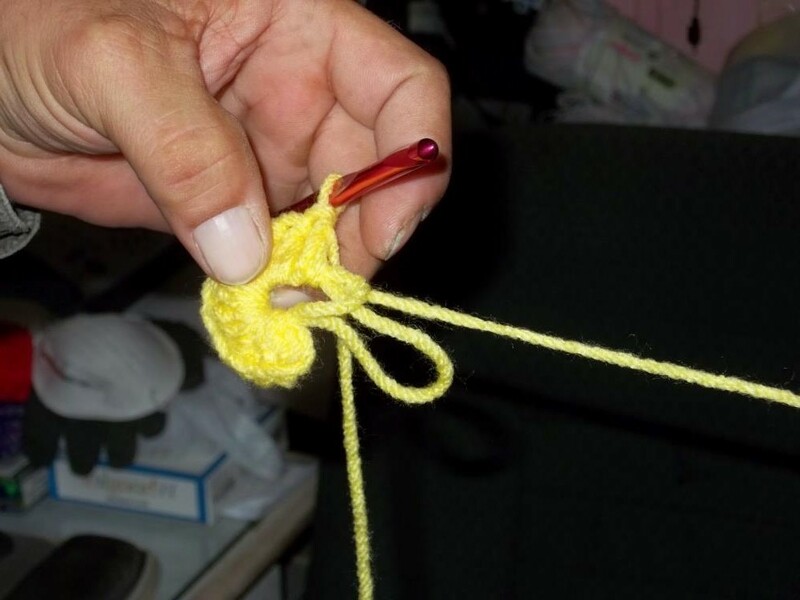 The best part is NO ENDS to weave in after completion. 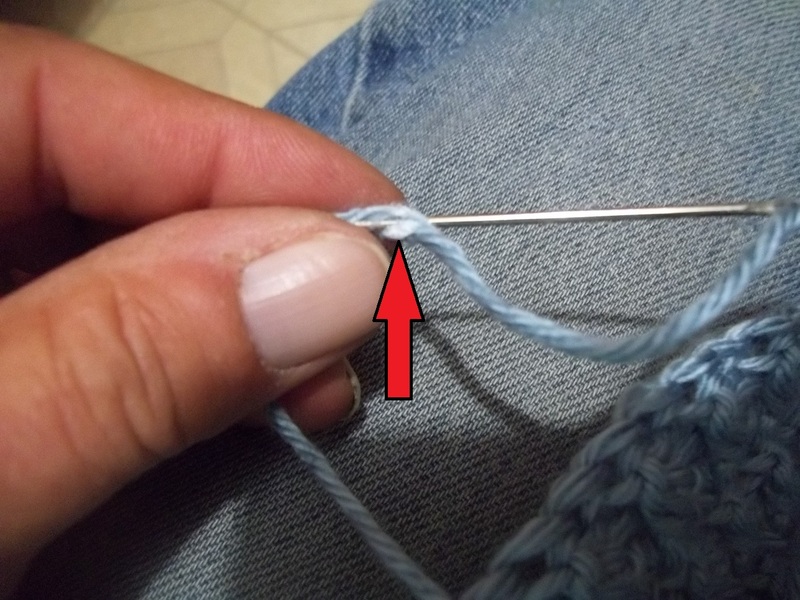 After two rows the Color Change Join looks Nice and Clean to me, how about to you? 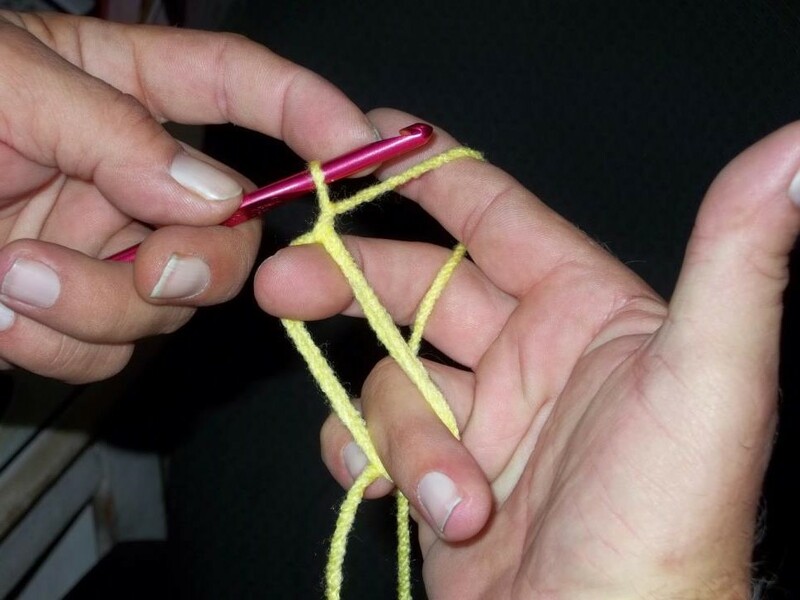 I do NOT grab a Yarn Needle. Then I grab a stiff Bread tie wire or a Wire that was holding a cord when I bought something. These are coated and I take and pinch the coating between my finger and my thumbnail and strip about ½" to ¾" off one end and I bend the bare wire into a U shape to form a hook like. 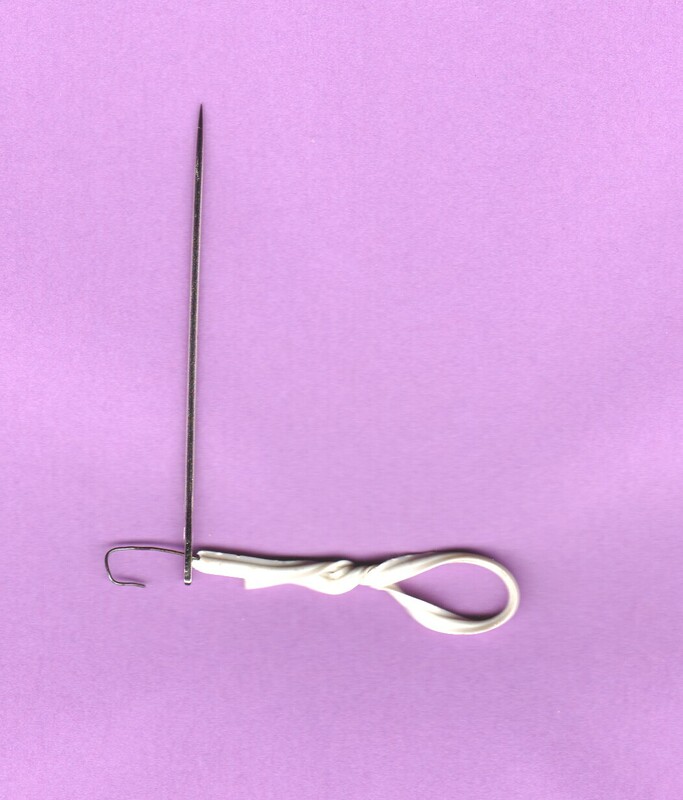 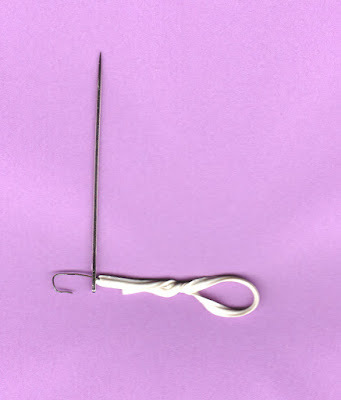 I then fold over the other end and make like an eye to hold my newly formed Needle Threader with. WHY Go through all this trouble, you ask. Because now I can go through the actual yarn fibers (like through the center of the yarn) instead of weaving the ends in through the stitches themselves. This makes them stay longer as they are tighter and look a little better to me. 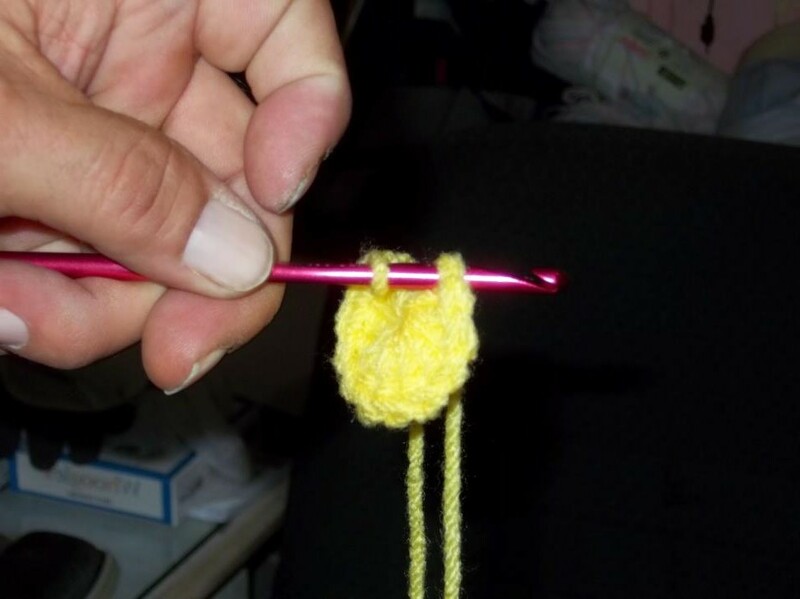 Here is a picture of my Yarn Threader stuck through the eye of a Yarn Darner needle. 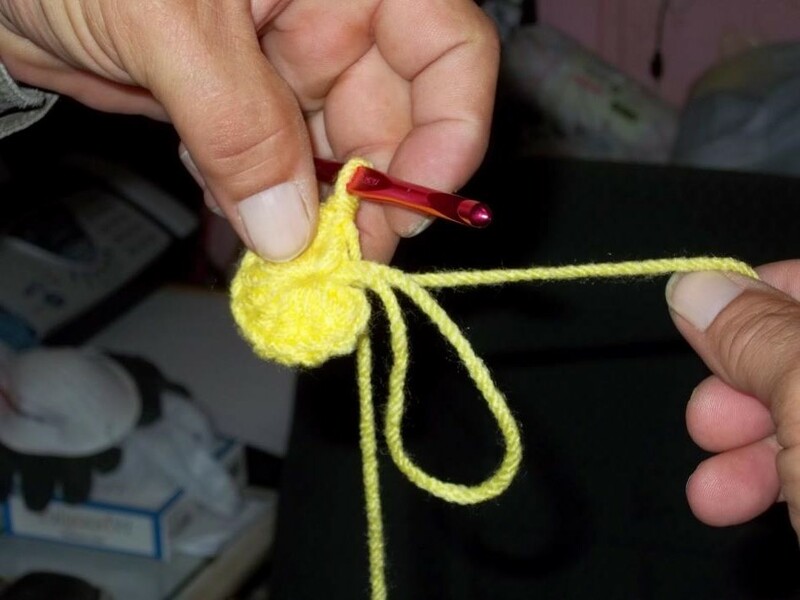 You just catch the yarn in the hook and pull it through the needle eye. 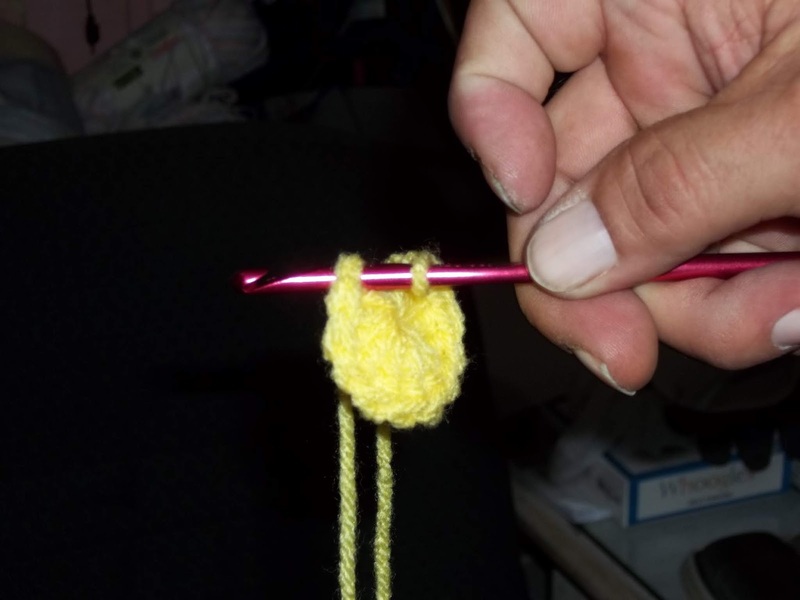 The one pictured works on yarn thicknesses up to but not including Bulky weight. Let me know what you think of this by leaving me a comment. 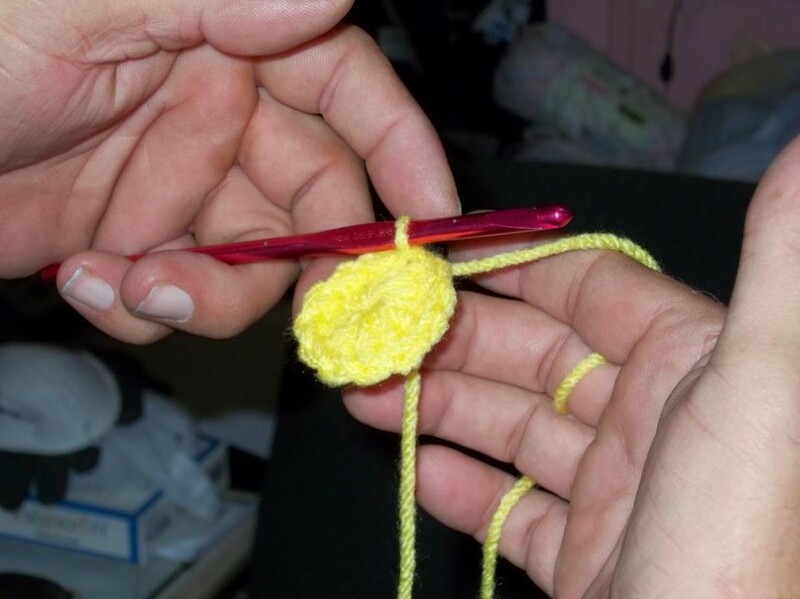 I have been crocheting since 1964. 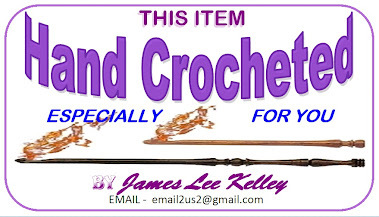 I have been designing and writing patterns for over 10 years, publishing patterns about 7 years. 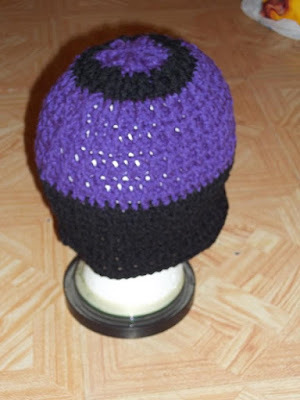 I have made and donated over 4000 items (mostly hats) over the past 10 years and sold over 1000 items in the same time frame.